Product #16564 | SKU SP32016 | 0.0 (no ratings yet) Thanks for your rating! 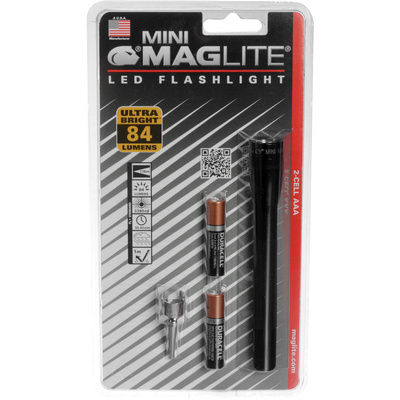 The Mini Maglite AAA LED Flashlight from Maglite combines the classic Maglite design with latest generation LED bulb technology for handy and powerful illumination when you need it. With a high brightness of 84 lumens, the Mini Maglite offers and intense light in a compact form. Its simple twist-top mechanism turns the light on and off and focuses the beam from spot to flood. Its maximum throw is 380' (116 m). This compact flashlight weighs less than 2 oz and is manufactured with a rugged aluminum casing, O-ring seals, and anodized corrosion resistant finish. It is water resistant and shock resistant up to 3.3' (1 m). Power is supplied by 2 AAA alkaline batteries which last up to 5 hours and 45 minutes. Candle mode light is available under the tail cap and a spare lamp is housed there as well. The tail cap is vented to reduce the chance of gas buildup inside the case.